Munchies Pool and Pizza. Serving a delicious range of pizzas, redefining the current pizza status quo. They serve tasty and fresh fast food in Kimberley. 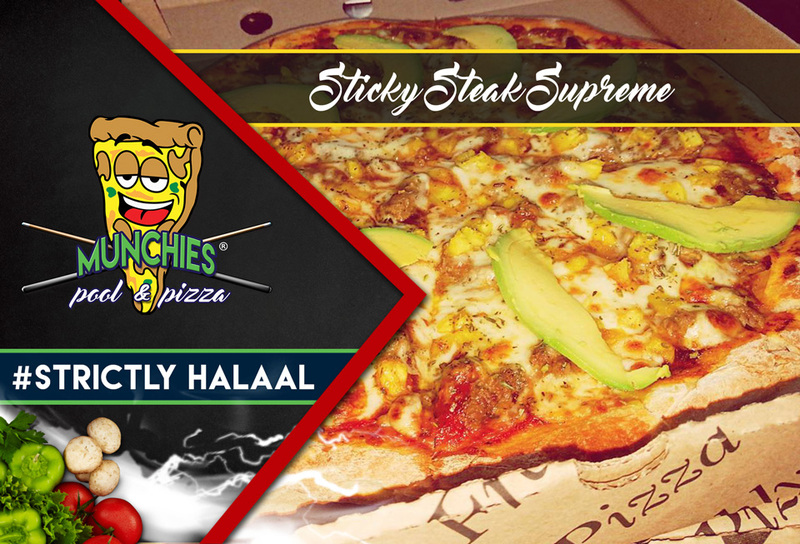 Munchies Pool and Pizza has a unique selection of pizzas on their menu, with different toppings that vary from biltong, macon and wors, to pineapple, peppadews, avo and many more. 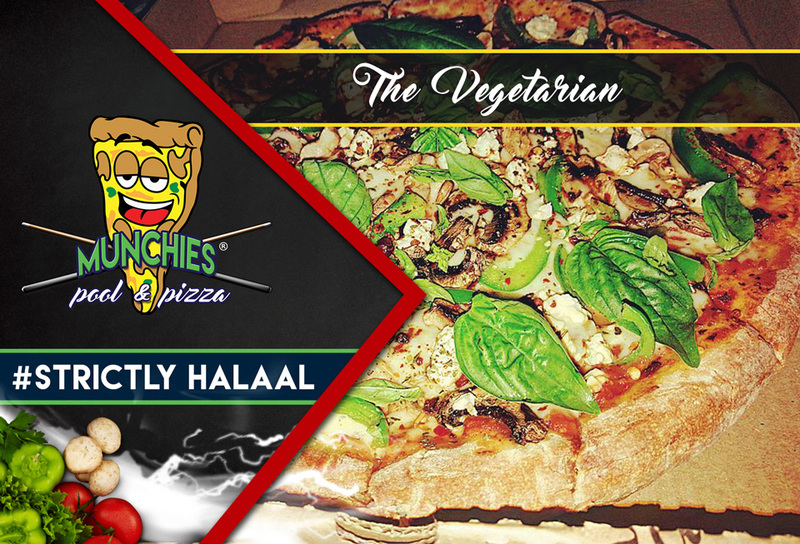 The freshest ingredients, crispy hand tossed pizza bases, generous toppings and Munchies authentic pizza sauce is what makes these pizzas so special. 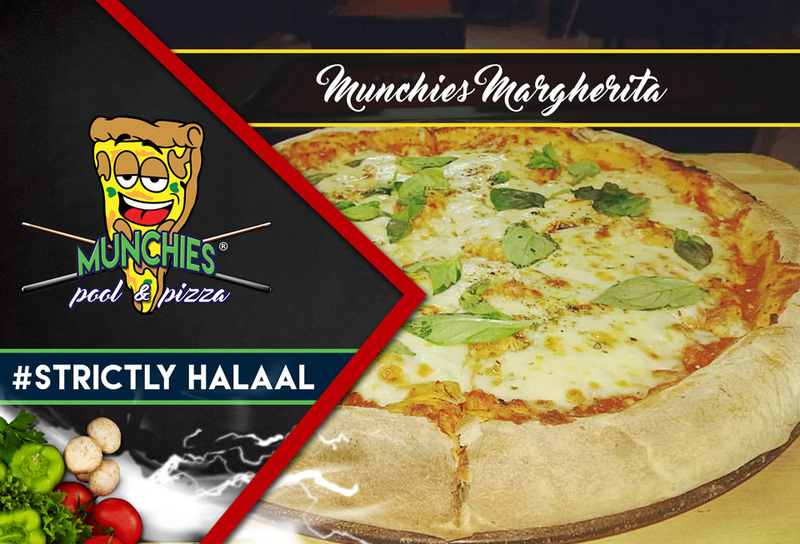 By combining delicious food and excellent service, they are on a mission to make Munchies the synonym for delicious pizza. We now offer deliveries through Mr D Food. Download the Mr D Food app now on your iPhone or Android device. 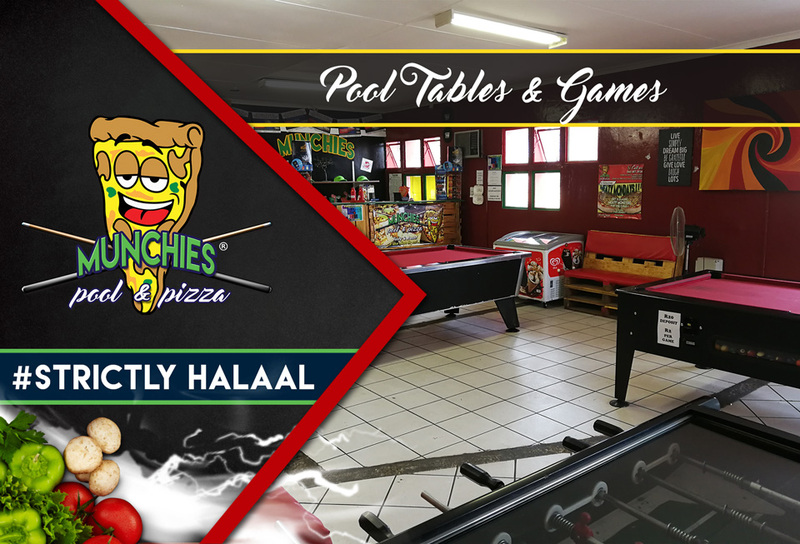 Munchies is a safe child-friendly environment where the whole family can come and enjoy delicious freshly prepared food, comfortable seating and have fun playing a round of pool or foozball. 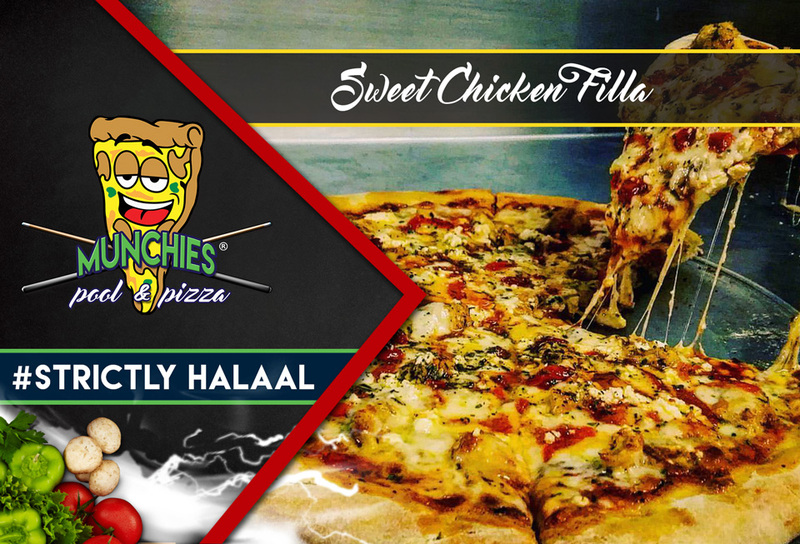 At Munchies, delicious fast food meets pure clean fun and entertainment. Customers can enjoy a game of pool while they wait for their order to be served. 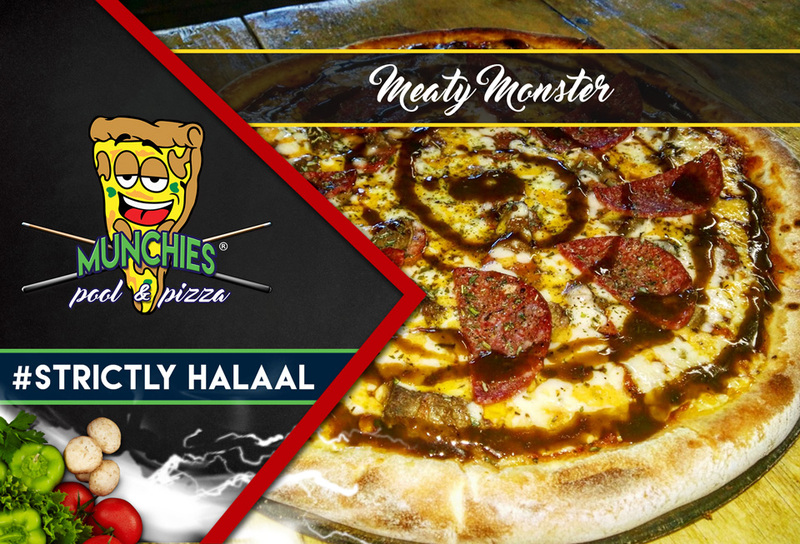 Munchies offers delicious pizzas, fresh chips and all-new original baked burgers. 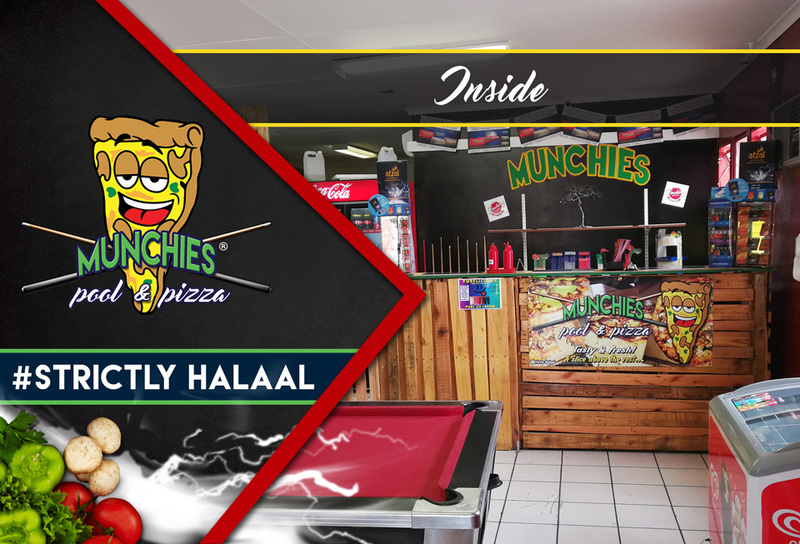 Munchies Pool and Pizza is 100% Halaal. Munchies Pool and Pizza is a 100% local, youth-led company founded by two visionary young entrepreneurs, Gwynneth-Claire Starr and Faa-iq Beyers. When asked about their dreams for Munchies, Gwynn said this: " We give every person who comes into Munchies a unique, one-of-a-kind experience. With our warm customer service and delicious menu, we hope to leave a lasting impression on every one of our customers, making us a trusted name throughout the city". Her partner, Faa-iq added: "We plan to be a leading name in the fast food industry, known and trusted for making the best pizza." Very tasty Pizza, nice atmosphere, friendly owners and value for money. A must visit place while in Kimberley. A fantastic place to eat, excellent Pizza, friendly staff, value for money and nice atmosphere. Favourite Pizzeria when visiting Kimberley. Give them a try, you will not be disappointed. Love their food, best ever!!! 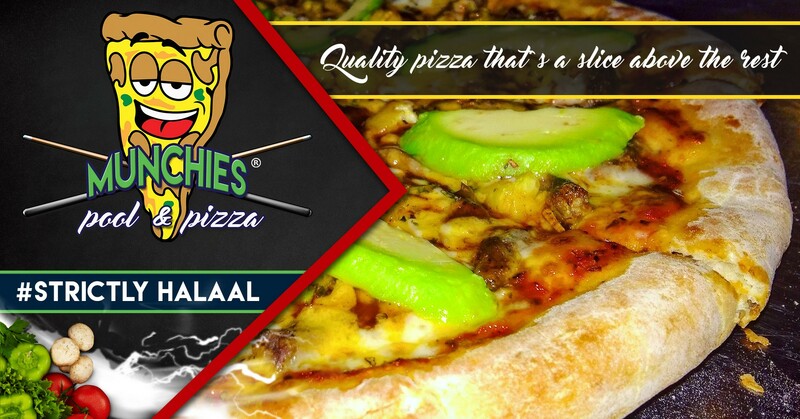 Best Service in Town,Best Pizza Joint in the Northern Cape.Highly recommended for all pizza lovers. The vegan pizza you made for us was amazing! Impressed with your quality of food 😀 definitely having again! Im not really that into Pizza but you guys have officially converted me into a pizza lover! Your Pizza is amazing and your service is awesome! Good tasting pizzas and it smells delicious and fresh when you enter the shop.I will definitely come agian. I’m no fan of pizzas but munchies take the cake. The sticky steak is a must to try. Taste, service and quality �I will be visiting regularly in future. Thee best pizza in kby…by far. Awsome service too. U guys rock! I visited the shop for the first time today and was told by the staff that I was in for a treat. Seeing them prepare the order I expected a good tasting pizza but not sure if I would be in for the so called treat that I was promised earlier. On the way home I was salavating from the smell coming from the boxes. I have NEVER had such delicious tasting pizzas. The meat is full of flavour and I was also not expecting the portions to be so large. Thankfully I have some leftovers to take to work tomorrow. Well done Munchies on the BEST pizza in town. You will definitely be seeing us again! Best Pizza I’ve had in a while.. 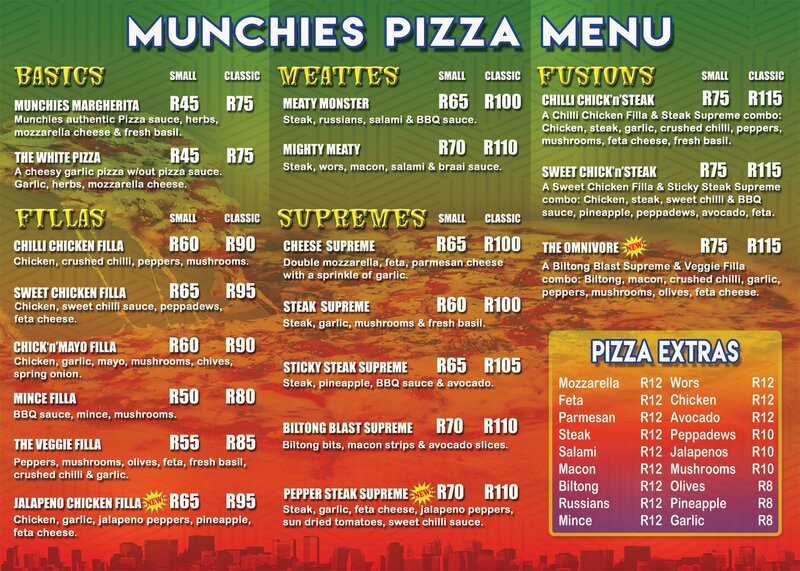 The name says it all…munchies…the place to fill up all your hunger needs…. 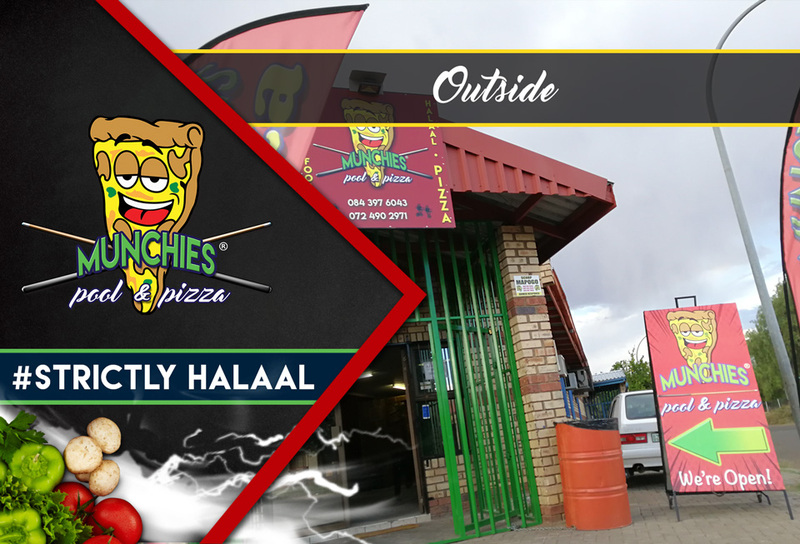 Best pizza in Kimberley! Great service as well. And thankfully it’s halaal! We keep going back for more. We’ve become addicted. Keep it up guys! So excited about this place!!!!! Looking forward to an off weekend just so I can indulge in all of this yummy goodness! Munchies Pool and Pizza is AWESOME!! Not only did I get a DELICIOUS pizza (I was happily stuffed after eating it! #meat_lover), but I hooked up with old friends and made new ones over a few games of pool. Munchies delivered on what they promise! They will definitely be seeing me more often! 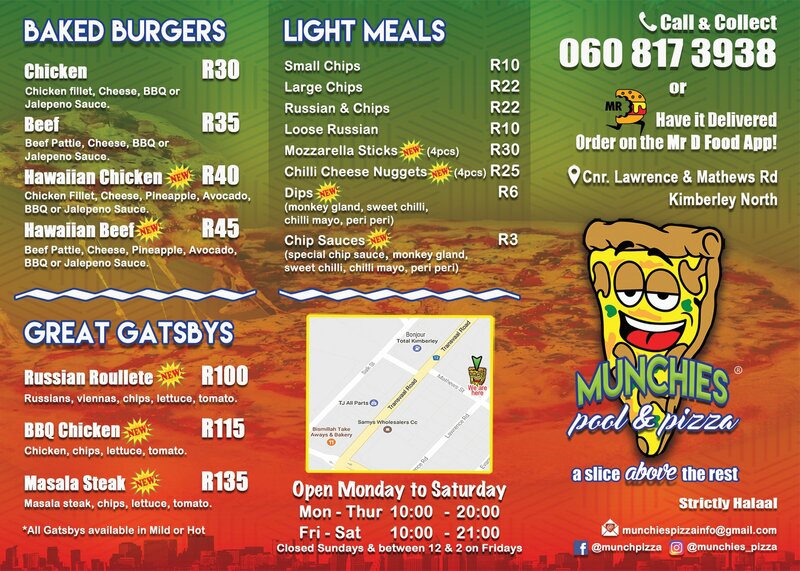 View all events in "Munchies Pool & Pizza"